The 2017 Class 9A state champion Timber Creek Wolves. Whether or not your team wins a state championship at the end of the season, every dedicated coach has demands from his players in how to execute that plan. Guys are asked to do a lot, but most of all they are asked to trust their coach and believe in that process. Over the course of things that trust is tested and adversity is faced, but when the story can end by realizing a dream come true there is no better sense of satisfaction and accomplishment. For the Timber Creek Wolves that dream came true on Saturday night, as the Wolves earned a 5-0 shutout over the University Titans to win the 9A state championship. 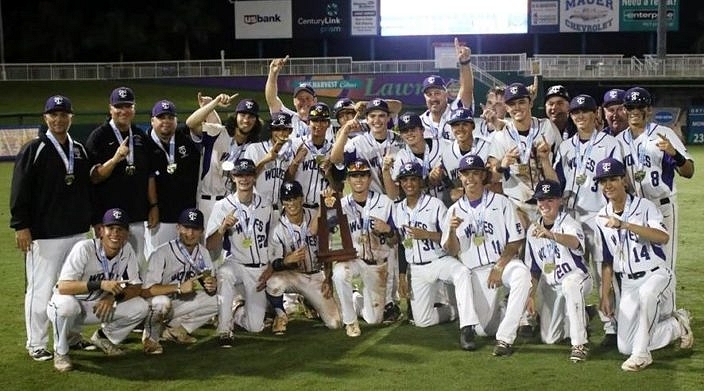 As the team celebrated afterwards under the lights of Hammond Stadium in Fort Myers as state champs for the very first time, the hard road taken to get there only made the accomplishment that more rewarding. Across the diamond was a University Titans team that had lived their own same story to reach the pinnacle moment. This is not the ending they wanted, but that loss cannot ruin the whole story either. The Wolves dogpile to celebrate after finishing the game. 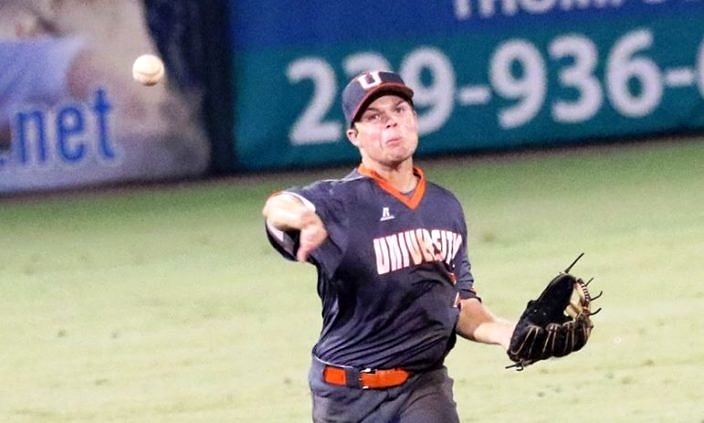 Preston Schumacher made the start for the Wolves (25-7) and nearly went the distance for a career day, before pitch-count limitations forced him to trust reliever Jason Riley to record the final out. The right-hander allowed five hits and three walks, with a season-high 12 strikeouts. Schumacher last had an outing like that in late March, when he allowed one earned run and had nine strikeouts in a no-decision. But after serving as the club’s closer and finishing off two playoff games, the junior got the call in the big game and he flourished under the spotlight. Schumacher established his curveball right away, which helped him get into a groove almost immediately. He had a perfect 1-2-3 frame with two strikeouts in the top of the first, and he never looked back. Timber Creek opened the scoring for all the run support it needed in the bottom of the second. Parker Smith lined a single into shallow right field, Zak Sousa reached with a bunt single and Nick Ruhl advanced both runners into scoring position with a sacrifice bunt. An error allowed Smith to score and Cameron Meehan followed with an RBI single to center to give his team a 2-0 advantage. The Wolves were back at it for another pair of runs in the third. Marcos Roque reached on an error and Smith delivered again with a booming shot high and deep over the center fielder. Roque came all the way around to score as Smith slid into third base with an RBI triple, before then also scoring after a throwing error. The fifth inning brought another run onto Timber Creek’s lead. Marcos Roque smacked a stand-up double into the left field corner and Paxson Chambers followed with an RBI single up the middle and just out of reach of the diving shortstop to plate Roque for a 5-0 lead.